David Davies: "Let's see those video moblogs!" 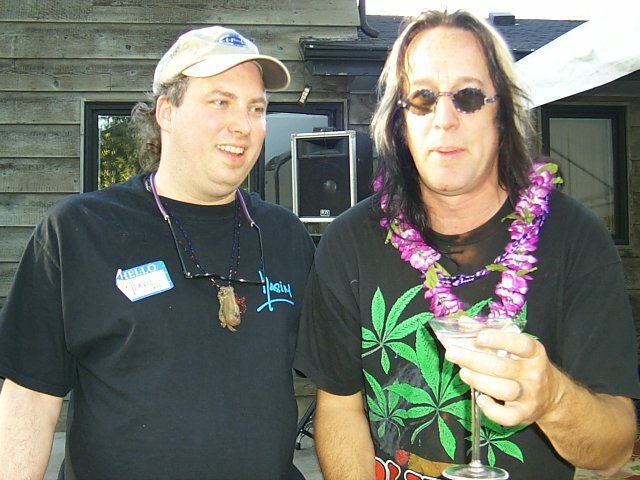 Just heard an interview on NPR with Todd Rundgren about music on the Internet, the value of a song, albums, and how the users are now in control. Todd says that iTunes is the wrong model because it commoditizes music, with every tune priced at 99 cents. He's the guy to look to for the killer app in online music, he's always been first. I played a Rundgren song at last week's webcast and people groaned "Oh that's 80s music." What I didn't say is that's music from the guy who could figure out how music on the Internet works as an art. (And besides that, it was 70s not 80s music.) This week I played a Rundgren-produced song, and the kids liked it. He was one of my heroes in the 70s and 80s, and then later when personal computers took off I got to hang out with him in San Francisco. Chris Lydon interviews Larry Lessig. Just listened to it, great stuff. Reminder -- there's a special RSS feed for Lydon interviews, with enclosures, that can automatically be downloaded overnight by enclosure-aware aggregators and feed readers. RealAudio archive for last night's webcast. In MP3 format. Fantastic story by Zeldman of the beautiful website for a Semantic Web conference. Is it semantic? No, but it is beautiful. I was joking with a friend about doing a new format, MCS, an acronym for More Complex Syndication. Here's how you'd cook it. When Atom starts settling down, make a list of features it has that aren't present in RSS 2.0. Then copy the RSS 2.0 spec, creating a new document. Do a search and replace, changing the string RSS to MCS. Replace the Roadmap section with a single acronym, TBD. Then carefully add all the features on the list generated in part 1. Then as Atom changes, change the MCS draft spec to include the new features and remove the deprecated ones. Of course this is a joke, I have no plans to actually do it. News.Com: "What is the impact for peer-to-peer fans of a court decision that knocks back the recording industry's legal strategy for tracking down and suing alleged file swappers?" Economist: "The coffee-houses that sprang up across Europe, starting around 1650, functioned as information exchanges for writers, politicians, businessmen and scientists." Ryan: "So here's a kiss, for Joey and for Wendy. You've just shown me another beautiful side of the Internet." John Palfrey comments on the Verizon decision. Donna Wentworth has a roundup of articles on the news. BBC: "There was more bad news for the record labels, this time from the Dutch Supreme Court." The Dean weblogs ping changes.xml for RSS feeds. Here's howto have your RSS feed included in the flow, even if it's not a Dean blog. NY Times: "The broad presidential powers invoked by the Bush administration after the Sept 11 attacks to detain suspected terrorists are now being challenged by the courts." Last update: Friday, December 19, 2003 at 9:26 PM Eastern.